Initially developed by Indian Government to do research on production and utilization of salt but since then it has developed itself into a multi-disciplinary research institute with a blend of scientists and technologists having specializations (Doctorate) in Chemistry, Biology and Engineering Sciences. At present the institute has around 350 staff in its roll and a sizeable number of project assistants. The mission of the Institute and its people is to work in partnership with visionary sponsors and collaborators to generate the knowledge and innovations required for efficient utilization of coastal wasteland, sea water, marine algae, solar power and silicates. The Institute also harnesses its capabilities in biosciences, chemical transformation, process engineering, environmental monitoring, separation science and analysis to address focused needs of industries and organizations in the region and beyond. In 1996, CSMCRI started cultivation of JATROPHA in eroded wastelands with support from UNDP/TMOP, Dept. of Bio-Technology (Govt. of India), DaimlerChrysler to produce Bio-diesel complying with EN14214 specification from the plant. This project was helping effective utilization of wastelands. JATROPHA fuel has proved suitable for neat application (without any form of blending) in unmodified engines. 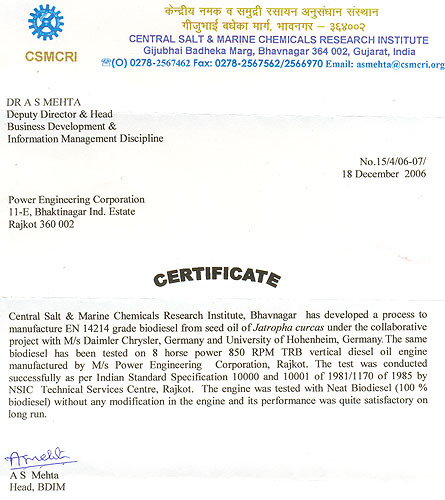 DaimlerChrysler undertook vehicle testing using two Mercedes Benz C-220 CDI, vehicles without engine modification with CSMCRI's neat bio-diesel during April-May 2004. Distance over 6000 Km was covered and mileage was compared to that found with Diesel (Liter for Liter Jatropha bio-diesel has ca. 91.8% of the calorific value of fossil diesel), and no problem of any kind was encountered particularly the dramatic reduction in Particulate emissions. The high point of the trials was the successful test drive of the car by renowned Auto Journalists to Khardungla Pass , the highest (18,380 ft.) motorable road in the world. The collaborative DaimlerChrysler – CSMCRI – Hohenheim Project was given the DaimlerChrysler Environmental Leadership Awards in Magdeburg in November 2005. Our 8HP-850 RPM Lister Type Slow speed Diesel Engine Sr. # 30048 was tested with CSMCRI Bio-diesel by National Small Industries Corporation (NSIC), Rajkot on September, 2004. As per the observatory Report No. PBD-2 of NSIC, engine was running successfully as per Indian Standards Specification 10000 & 10001 of 1981 / 11170 of 1985, under this CSMCRI project. Reports of Diesel Engine Tested on Biodiesel as per Indian Standard's specification 10000 & 10001 of 1981/11170 of 1985, under CSMCRI, project where reflned Jetropha Biodiesel was supplied by CSMCRI, Bhavnagar. Nominal Comp. Ration : 19:1 Cubic Capacity : 1.4330 Lit. Manufactured by : Power Engineering Corporation, Rajkot. Following conclusions are made from the results and ovservations. » The bio-diesel is more eco friendly compare to Diesel. » Without any modification in Diesel Engine the Bio-diesel can be used as fuel. » The wear and tear on components is under limit. » Bio-diesel is more suitable fuel for slow speed Diesel Engine compare to high-speed Diesel Engine. » Exhaust temperature is higher compare to diesel operation. » 100% fuel replacement is feasible only with pure bio-diesel. » Lubricant oil get early deteriorate compare to diesel due to the glycerin as composition in bio-diesel. » Specific fuel consumption is Higher (8 to 15%) comparing to diesel without modification in Diesel Engine. » The test was conducted for 10 cycle only as per BIS Norms. » To have more details study it is suggested to undergo the test as per IS-10000 & 10001 of 1981/11700 of 1985 which consist of 512 hours test (32 cycle-16 hours per day). » Bio-diesel can be better fuel for future, which is made from agriculture product (Renewable Energy). » Bio-Oil is also one of the alternative fuel can be use along with Diesel up to 20% without refines.